The Everglades get all the press. Most folks will turn the direction toward the Everglades off the Florida Turnpike, yet just outside the town of Homestead if you turn the opposite direction you’ll land yourself right in the middle of its sister National Park, Biscayne, which is 95% water and the shoreline is flanked with protected mangroves. This means you can expect an abundance of birds and when we visited the park today we arrived just in time for one of the scheduled bird walks with park volunteer, Arend, a retiree from Maine who spends his winters, along with his wife, in the sunny climate of south Florida. You can’t blame him. 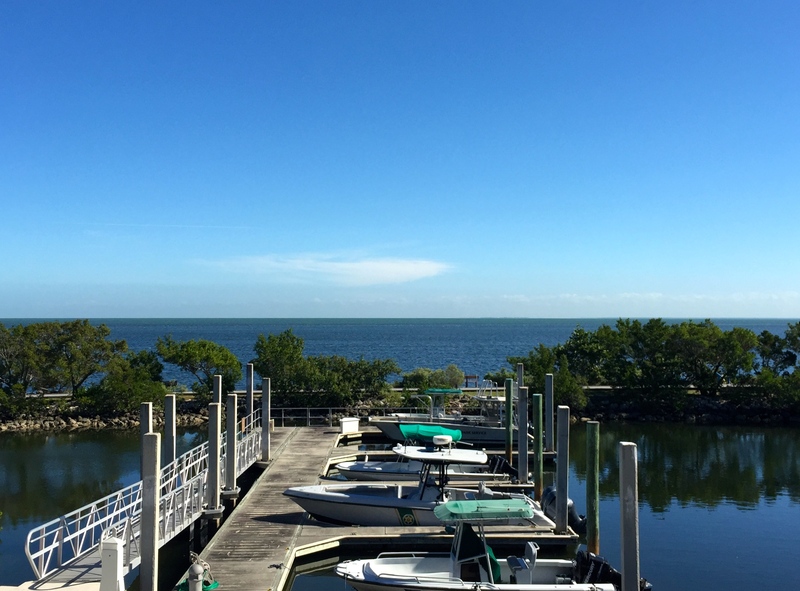 Biscayne National Park. Not a bad place to spend your winters. Tick, tick, tick. Check, check, check. Naturally, we tick off birds on a list. It helps me remember what I saw and where, and it’s really more like note taking. While some will race to fill a list, trying to see as many birds as possible, that’s not how I approach birding. I’m not judging those who tick and move on quickly. There are many different styles of birding and there’s room for everyone. For the most part, I’ve found birders to be nice people. But for me, it’s a relaxing hobby, not a race and why would we want to put pressure on ourselves or our guides? I already have pressure at work. I certainly don’t need that when I’m away from the office. 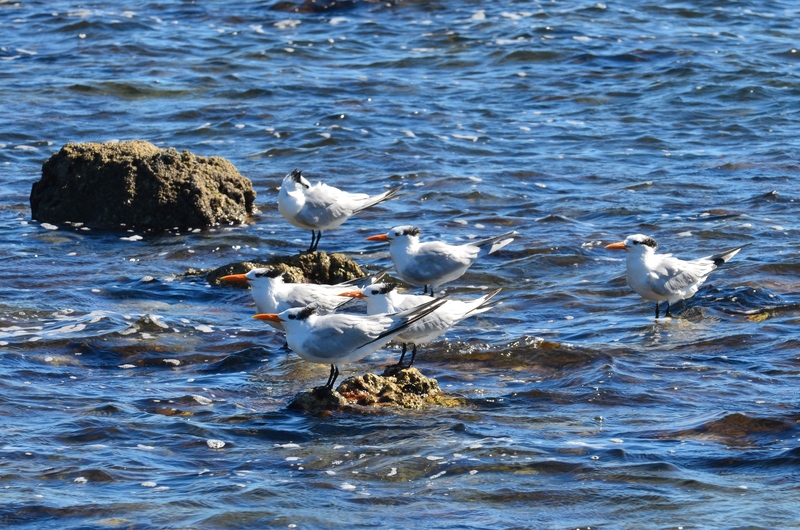 Royal Terns. See? Birding is relaxing. Nature is always a teaching moment and you miss out on so much if you’re just trying to tick off birds on a list. A birder just visiting the park who is focused only on seeing a bird and moving on to the next would have missed the giant manatee in the marina next to the board walk. The lumbering 14-foot long mass was hanging around to occasionally stick his nose out of the water as if to greet us. We also happened upon some Ruddy Turnstones that were doing exactly what their name promises–they were turning stones, wasting no time as they looked for bugs, critters, and fly larvae. Could I have just check this off my list and moved on? Certainly. But I didn’t. I watched as they turned stones to and from as if they were flicking confetti. How do you approach birding? Have you come across something that made you slow down, stop and watch? I agree Lisa – the best way to bird is to take it all in slowly. That way you also get to learn the behaviour of the birds, and enjoy them. Yes, slow is so much better. Plus I’m getting so old I can’t keep up the pace. Heh. I confess to a history of bad-mouthing certain competitive birding styles so I applaud your generosity of spirit, and you’re right, there’s room for everyone. I know I’ve seen turnstones but don’t remember if I saw them turning stones! Great! And how I love watching terns – any terns, but those big Royals are really cool. Thx for the vicarious pleasure! Bluebrightly, I will confess that I have trouble in groups or on tours. Sometimes we’ve been lucky and have birded with people like us, but there have been other times there are people who take it waaaaaaay to seriously. It’s rough on the guides.